Baird is also the author of BenBella book, The Innovation Blind Spot: Why We Back the Wrong Ideas and What to do About It, which is based around three blind spots. The first is how we invest, the second is where and who we invest in, and the third is why we invest. Ross Baird is President and founder of Village Capital, a venture capital firm that takes a unique philosophy and approach to choosing the entrepreneurs they fund. Baird has worked with hundreds of entrepreneurs in over 50 countries and has visited over 100 cities worldwide in an effort to find new entrepreneurs and help the people supporting them. Baird is the author of BenBella book, The Innovation Blind Spot: Why We Back the Wrong Ideas and What to do About It. He has a masters in philosophy from the University of Oxford where he was a Marshall Scholar, and a B.A. from the University of Virginia where he was a Truman Scholar and a Jefferson Scholar. Glenn Yeffeth: Welcome to the Building Books Podcast. I'm Glenn Yeffeth, publisher of BenBella Books, and on this podcast, we will talk about ideas, authors, and how publishing really works. Glenn Yeffeth: Well welcome Ross. 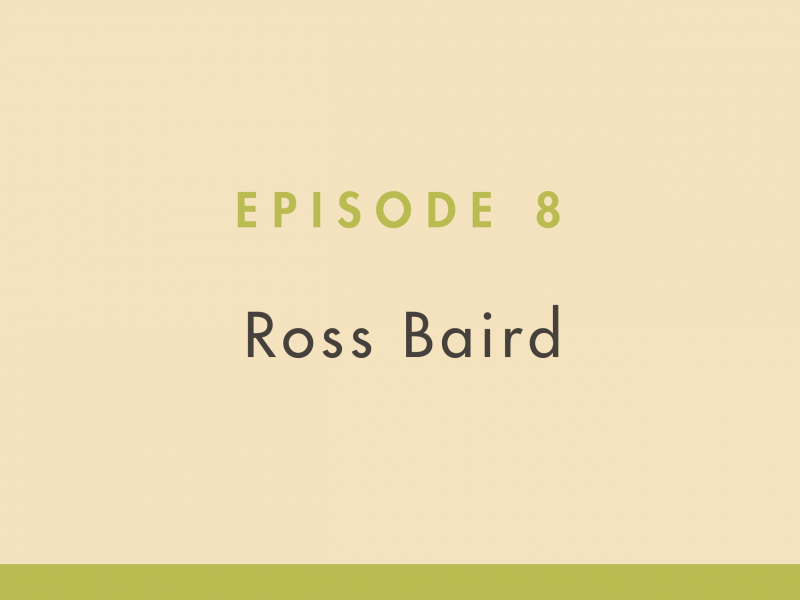 I am thrilled to have Ross Baird here for this podcast. Ross founded Village Capital in 2009. Village Capital, which Ross will talk a bit about, is a venture capital firm that takes a unique philosophy and approach to choosing the entrepreneurs they fund. Ross is the author of our book, The Innovation Blind Spot: Why We Back the Wrong Ideas and What to do About it, which is coming out in paperback this month. Ross has worked with hundreds of entrepreneurs in over 50 countries and has visited over 100 cities worldwide in an effort to find new entrepreneurs and help the people supporting them. He has a masters in philosophy from the University of Oxford where he was a Marshall Scholar, and a B.A. from the University of Virginia where he was a Truman Scholar and a Jefferson Scholar. Welcome Ross. Ross Baird: Hey Glenn, great to be here, thanks for having me on. Glenn Yeffeth: Oh it's my pleasure. Well let me start with, one of the things I loved about your book is a big picture look that it takes at our economy and our country and as you know, and you sort of talk about this in the book, we're living in a country now were the majority of people feel like we've gone in the wrong direction where over half of young adults say they don't support capitalism. Well, what's gone wrong? Ross Baird: I wrote this book not because I felt like I had something to say, but I wrote this book because I was noticing a story that wasn't being told and I think the process of writing a book helped me try and figure out answers so I think at our very top line measures, the DOW Jones, the number of billion dollar tech companies, it appears that our economy is doing well, it's never been better but when you go a bit deeper the success is highly concentrated. It's much more concentrated than it's been, so 50% of the new firms after the Great Recession were created in just five metro areas is just one example so when you look at our basic metrics, people in America should be optimistic about the direction we're heading but [inaudible 00:02:20] just look at our politics, it's very very clear that people don't feel that way and wanted to spend some time figuring out why. Glenn Yeffeth: Well that's great. So let's back up a little bit, tell me a bit about Village Capital and what it does. Ross Baird: So Village Capital is a firm I founded about a decade ago and we tried to find and support and invest in entrepreneurs that have direct experience with the big problems that our country and our world are facing, and what we have always understood is the system by which entrepreneurs get access to capital and the opportunity to grow is also pretty concentrated. So if you are somebody who looks like me and went to an Ivy League school, you probably know lots of people who have the resources to support you. If you're in New Orleans or Nairobi or the wrong side of a wealthy city, it's very, very difficult no matter who smart you are or how hard you work to get off the ground. Ross Baird: So Village Capital, we think the people who can solve diabetes and opioid and other health crisis are people who have direct experience with these crisis. The people who are able to figure out how a rapidly changing planet can continue to feed itself are people who are from agriculture communities, for example. So we try to find entrepreneurs who are not in the mainstream and backbone. Glenn Yeffeth: And so your firm is really based on the idea that venture capitalism, or venture capitalists as that community exists now, is isn't fully meeting the need. Ross Baird: Completely, and I tell this story are the beginning of the book, but we support entrepreneurs, and one of the very first stories I tell is an entrepreneur named Jerry [inaudible 00:04:06]. Jerry was an immigrant, grew up in South Florida, and saw his mom getting ripped of by check cashers and payday lenders. He, [inaudible 00:04:16] to go to college, goes to Wall Street to try and figure out how money works and figure out how to help people like his mom to get out of debt. So he starts this company, he's living in Charlottesville, Virginia at the time, and he goes out and tries to raise money to start his company and Jerry was unsuccessful for a couple years, and when I first met him he had pitched several hundred different people on giving him a shot and completely struck out. I said, "Jerry, what's the deal?" And he says, "You know, venture capitalists talk about pattern recognition all the time, like it's a good thing. Let me break it down for you: I'm a black guy, I live in central Virginia, and I'm solving poor people's problems. I'm 0-3." Ross Baird: And we see tens of thousands of Jerry's and I think a lot of economists assure that resources go to the best and most productive uses, but people are highly biased and make decisions for all kinds of reasons and we think that the decision making process and where resources go tends to go to the people who are 3-3. Glenn Yeffeth: So who are the kinds of people that tend to get funded? Ross Baird: Well, look at the big tech companies in the Bay Area. It tends to be... I'm a white guy I have nothing against white guys, but it tends to be people who are largely go to one of a few schools, Ivy League Schools, Stanford, etc., tend to be male, tend to be well educated, tend to be from well off backgrounds, tend to have access to family or friends' money to be able to start their company. Whether it's your parents or your dorm roommate or whoever, and these are all things that... it's very very hard to build a company and people work incredibly hard but there are sometimes built-in structural advantages where a certain type of people have more of a right or ability to compete than others. Glenn Yeffeth: And also from a relatively few places. Ross Baird: Yeah, so 80% nearly of venture capital last year went to just three states, Massachusetts, New York, California. Steve Case who wrote the foreword to the book has a whole initiative called, "Rise of the Rest," where he's focusing on correcting those imbalances, but if you're in the middle of a country you're not located near too many people who have tremendous resources and it's much, much harder to get a start. Glenn Yeffeth: You argue that not only is this unfair, but it actually misses the most important opportunities. Ross Baird: It seems like such an obvious point, that the people who are best placed to solve a problem are the people who have the most direct experience with the problem. So Village Capital, we've invested in a firm called Rimidi, and it was founded by a woman named Lucy Ide in Atlanta and she's an Md PhD who's developed what is now the fastest growing diabetes management platform in our country. So we spend 4% of our GDP in America on just treating diabetes and these are mostly low and middle income populations who are chronically sick, and Lucy was an Md PhD in Atlanta who had a ton of experience treating diabetes patients and she develops this solution. Ross Baird: So she starts this company around the same time a Silicon Valley entrepreneur started the company Theranos, which raised $700 million, started by a woman named Elizabeth Holmes, who went to Stanford, who was not an Md PhD, who had not spent a lot of time out in communities working on health, but came up with an idea that you could prick your finger and do a blood test, and it seems so easy and it seems too good to be true, and it was. It turns out Theranos was a fraudulent company, but they raised $700 million because famous people in Silicon Valley were backing it. Ross Baird: It took Lucy and Rimidi five entire years to get off the ground because she couldn't find the resources to back her idea. Finally, and we were part of this at Village Capital, she scraped together some seed money, she didn't take a salary for a long time, finally after year and going through the right directions and doing the clinical trials that Theranos never did, they saw results that were evidence based and very promising, and they just recently got a lead investment from Lilly and it is now the leading technology powering Lilly's diabetes management platform for the whole country. It's taken Lucy almost 10 years to get off the ground because she wasn't in the mainstream. She had the right idea and the right insight and now it's working but she almost gave up a couple dozen times and imagine how much faster and easier and more seamless the idea would be if she was able to access the same resources that Theranos was. Ross Baird: And there are so many other people who don't even get on the radar, I mean Lucy is one of the lucky ones who has been able to give it a shot. So we think that if we care about problems, whether it's climate or inequality, or opioids, I mean the things we read in the paper every day, there are people who are on the ground who know how to solve the problem and have ideas but don't have opportunity. Glenn Yeffeth: One of the things that fascinates me is not only are you trying to fund the different person, your process for deciding who gets funding is also very unique, can you talk about that a little bit? Ross Baird: Yes, so part of my inspiration for Village Capital, I worked in India for a microfinance bank, and if you don't know anything about microfinance, it's one of the most transformative innovations we're seen in the last 30 years in terms of helping entrepreneurs access opportunities. So microfinance [inaudible 00:10:17] and emerging markets make small handshake loans of a couple hundred dollars to mostly women who live in rural areas and it seems like a tiny thing but there are about $30 billion invested each year in these small loans and there's nearly 100% repayment, and the reason why it works... one of the creators of the microfinance industry Muhammad Yunus won a Nobel Prize for this, the reason why it works is the decision making over which entrepreneurs get investment isn't made in conference rooms in London or Paris or New York, but it's actually made in the village. So think of a village in India with a bunch of small entrepreneurs trying to get their idea off the ground. The entrepreneurs in the village essentially select who gets a loan, they're best placed to solve it. Ross Baird: The inspiration for Village Capital was I saw a bunch of entrepreneurs like Jerry and Lucy, and I saw them being very far apart from investors like the people who are in New York and San Francisco, and one of the issues that we see in venture capital in American is the people making decisions don't reflect very often the entrepreneurs in the countries. So 2% of people who receive venture capital are women, 1% of people who receive venture capital are people of color. The decision makers are very similar, 2% of partners at venture firms are women and 1% of partners are people of color so I saw a big gap between the people out there doing the work and the people making decisions in firms and so I took this inspiration from microfinance which is people close to the problem, people in the community are best placed to make investment decisions. Ross Baird: That methodology is called the Village Bank in microfinance. Village Bank plus venture capital equals Village Capital, that was where the name came from, and we developed a process where entrepreneurs in our pipeline are the ones making decisions and what we've seen is when you put decision making power in the hands of different people, you get different results. So 40% of our investment have been in women, 26% have been in people of color, almost 90% have been outside the three states that otherwise get 80% of venture financing and the companies are outperforming comparable portfolios that are highly concentrated, so I think changing who's in a position to make decisions can make a big difference and can give you better results. Glenn Yeffeth: That's brilliant but I have to think that it was a bit of a goal to almost take, as the founder of Village Capital you were taking these decisions out of your own hands and distributing them that had to be challenging in some level. Ross Baird: It really is, I mean power is a funny thing and if we say to you as an investor, "We are going to invest money that you are responsible for," but you're not actually going to pick where the money goes, that's a pretty tough sell for some people. You really have to be a believer in entrepreneurs and you have to believe that the people building businesses will have good insights and we also have the structured process. I write about this in the book but it sounds like a simple and straightforward process today, we were proud of the results, but there were a number of programs and investments that we learned the hard way from. Ross Baird: So for example very early on we didn't have a structured process and sometimes it would be more of a popularity contest and the best liked entrepreneur would get investment and do well, and sometimes it would be a bit of a pity thing, it'd be like, "Hey Glen is a great guy, we love him. If we don't pick him for this investment he's not going to raise money out there so like we should give him an 'I'm sorry' investment and this didn't work as intended so we had to get very intentional and structured about the process and now we've made almost 100 investments and the process is very clear and structured and we actually have 30 affiliate partners all around the world who are using this process to make investments now but we learned by iterating what works and doesn't. Glenn Yeffeth: Now your book is called, "The Innovation Blind Spot" and you say there's actually three blind spots. The first is how we invest, the second is where and who we invest in, and the third is why we invest. Talk me through that. Ross Baird: Yeah, so when I started Village Capital I wanted to invest in companies like Rimidi or like Jerry's company [inaudible 00:14:57] Street that are building good business but also solving systemic social problems and I was seeing a lot of great ideas on the ground. When I started trying to raise money for my company I would talk to different people and this one guy who was a very successful entrepreneur had a very active charitable foundation, said, "Young man, this is really interesting, love what you're doing, but I've got two pockets. With one pocket I make as much money as I can and with the other pocket I give it all away. What pocket are you asking me for here?" And I said, "Well that actually clarifies," and I said, "respectfully sir, I see a bit differently. I think that businesses that have a core mission driving them, founders are motivated, investors are motivated, team members are motivated, it's... I see the world everything's in one pocket. You can't separate what you do and what you care about." Ross Baird: And he didn't invest, he didn't get it and I think most of the world sees the world in two pockets. If this is a do good thing it must be a nonprofit or it must be the job of the government, and if it is a business and if the role of the business is not to do anything but make money, a lot of people feel that way, but increasingly I'm seeing a one pocket world where people starting companies want to do something positive. People and to work for companies that reflect their values. There's a blurring of the lines between business and philanthropy that is really important and definitely the way the world is going. Glenn Yeffeth: You know it's funny because the people that you would think are the biggest believers in the power of business, the power of capitalism solve problems, put up a false barrier between the kinds of problems that capitalism can solve, when in fact maybe capitalism is the most powerful force for solving the problems we associate with nonprofits. Ross Baird: Potentially, I mean if you look at the numbers, and I talk about this in the book, add together the value of all of the charitable foundations in the world. You know how much it is, you can just guess, about a trillion. If you add together all of the public companies' value in the world, it's well over 100 trillion, approaching 200 trillion. If you add up all of the capitalist dollars in the world and make that the size of the Statue of Liberty, the philanthropic dollars in the world are the size of a grasshopper. So there are wonderful nonprofits, philanthropy plays a role like if in a one bucket world philanthropy plays a role, government plays a role, capitalism plays a role, but if we assume that government and philanthropy need to clean up the problems that capitalism, it's not its job to solve, it is a massively losing battle. Glenn Yeffeth: One thing I'd love to get your opinion about, I was just thinking about this the other day, venture capitalists are famous for funding a young entrepreneur because they like their concept, but then when the business gets to a certain level, they're like, "Okay you need to leave and we're going to put in professional management." But when you talk about, you name in your book five of the six most valuable companies in the world, Google, Microsoft, Amazon, Facebook, and then Apple which kind of did a U-turn on this, but basically they all achieved greatness under the leadership of their founders. So, do VC's have that idea wrong? Ross Baird: I think so, in many, and I've probably heard a thousand business plan competitions, pitches, etc., just over the last ten years, probably more than that and a very frequent question you here is, "What's your exit strategy?" Companies today when they're starting to finance folks will say, "Well what's your exit strategy?" Which basically means, "Who are you going to sell to?" And when Steve Jobs was starting Apple he did not say, "Oh my exit strategy is to one day sell to IBM. [inaudible 00:19:19] want to compete with IBM." And I don't think that our finance world looks at it that way. We have Google, Facebook, Apple, Amazon, we have very, very powerful companies and the assumption is if you can't figure out how to get acquired by them then you're just not worth investing in. Ross Baird: I think if I'm an entrepreneur and say, "I want to build a business and I want it to be a 30, 50, 100 year business." That's actually an unattractive thing to tell venture capitalists, which is crazy. Glenn Yeffeth: Now you've traveled all around the world talking to entrepreneurs. What have you learned doing that? Ross Baird: So much. I would say that the biggest thing is there are just so many people out there that want the opportunity to have control of their own destiny. I think that it's so hard to start a business and it's so hard to get up there and make payroll and compete every day, but I think one of the reasons why most people feel like life is on the wrong track, in politics or in business, is a lack of control. The big companies are going to do what they are going to do and there's nothing we can do about it, and the political parties are terrible and this person is going to do what they're going to do and there's nothing we can do about it, and I think a desire for control of what happens in your community or an industry that you care about, it's just being able to control your own life and say, "I don't mind working 'til midnight every night but I'd love to be free from 5-7 to pick my kid up from school and have dinner and I can't do that if I'm working in a faceless bureaucracy." Ross Baird: You hear these stories over and over again but the desire for people to be able to control their own destiny is just such a powerful and positive thing. Glenn Yeffeth: No, no question, and as an entrepreneur myself, I've been through it myself and there's definitely downsides to having your own business but having the sense of control over your own destiny really makes a lot of things worth it, there's no question about that. Most of us aren't VC's and we aren't starting up new businesses, we're working within companies, either large or small, do you have any lessons from the book that are for those folks? Ross Baird: Whether or not you are the founder of your own business, I think the lessons are the same. So one of the things that is true in any instance is people who have experience with a problem are best placed to be able to solve a problem, and I think that's true about your employees, your coworkers, your office, whether or not you run your own company. So I'll give you an example, I grew up and I was fortunate enough, there was a job I really wanted in between my junior and senior year of high school and it was an awesome unpaid internship and I was fortunate enough to be in a family where because I had a good job and it was prestigious and looked good on my college applications, I didn't need to make money that summer because I had a great internship. Ross Baird: One of the things, us, Village Capital being a one pocket firm, we actually found a lot of people willing to be unpaid interns for us and do a lot of work and initially as a start up watching capital, expenses, etc., it was like, "This is great, we can get really amazing people willing to work for free because our work is so inspiring." Ross Baird: Then, I brought on a team member and she grew up homeless, in and out of a foster care, in Berkeley, California, and now she's a partner, African American woman, partner at a major San Francisco, Bay Area investor and she did an amazing job running our programs for a couple year, and I said something about our internship and she said, "I would have killed to work at Village Capital when I was in high school or college, but I had to make money, and there are people like me who have to turn down the amazing internship with Village Capital because it's unpaid and instead work at Arby's because they'll pay you $8 an hour, and we need to pay our interns because we'll be able to get better and more diverse people." Ross Baird: And so thinking about who is in the room and making decisions and making sure that the people in the room have experience with the problem you're trying to solve is really really important, and so I think that no matter where you are, whether you're in a big company, a small business etc., what are the biggest problems you care about solving? Do you have direct experience with those problems? And if not, who can you get in the room and who's voice and you get at the table because you'll be much more likely to succeed. Glenn Yeffeth: I think there's a couple of great lessons in that and one of which, obviously just as you said, is when you are building, or hiring people into your organization, when you're choosing who to work with, it's so easy to go to the usual suspects and the folks that are different from the folks you typically bring on, bring something different, some knowledge base, some experience, that will prove to be valuable in a way that the usual suspects won't necessarily have, so no I really like that. So let's say you're a potential entrepreneur with a great idea but you're in the blind spot. You're in New Orleans or you're in Detroit, you don't have a rich family, what do you do? Ross Baird: I think that there, well I tell a story in the book, there's an entrepreneur we've invested in named Clarence [inaudible 00:25:10] who has a company called Upsie and Upsie is a warranty transparency company and it's a real blind spot business. Clarence grew up with a single mom, put himself through community college, and grew up with a lower middle class, largely African American social network and he saw most everybody he knew buying warranties and he saw people getting ripped off of warranties. A lot of the big box retailers make a significant amount of their profit margin off of warranties and poor people are much more likely to buy warranties than wealthier people. Ross Baird: So Clarence starts this company Upsie and when he starts pitching, he realizes that the average venture capitalist has a different experience than he has, like he tells an early story where he's pitching his company and the venture capitalist is like, "Well nobody buys warranties, when I break my iPhone I just buy a new one, it's so much simpler." And Clarence is like, "Well you can, but for a lot of people spending a thousand bucks out of pocket for a new phone is just not going to work." Ross Baird: But he ended up getting a potential commitment from a well-known investment firm and in their due diligence they figured out that when Clarence was 17 years old, he had gotten a police citation for getting into a fight and he's now in his late 30's and lives in suburban Minnesota and has two kids and he is just flabbergasted and they say, "We're really sorry we can't invest in someone with a criminal record." And part of me is thinking, "If I got a police citation, as with two educated parents, it probably would have figured out for 17 year old me how to not have it stay on my record." And you just come from very different backgrounds. Ross Baird: So they ended up deciding not to invest and we were pretty discouraged, but there was another guy who's an African American active venture capitalist and he talked to Clarence and he's like, "First of all that's really unfortunate, but second of all, man, Clarence, you are terrible at telling your story. That shouldn't have been a surprise to them. If they didn't know that you grew up poor... you should have said, 'I grew up poor, in fact, I was in and out of trouble as a teenage but then I figured it out and now I'm running this successful business.' There's a version of that story, Clarence, that could've ended up with you being rags to riches, then all these venture capitalists now brag about this rags to riches, great entrepreneur that they gave a shot to." I think that there are disadvantages, certainly, that come from being in a blind spot but I think you have to pay attention to the parts of your story that are different and interesting and you can almost turn your disadvantage on the head if you figure out the right way to tell your story you can get on people's radar. Glenn Yeffeth: I love the fact that you've taken the initiative, you've seen this issue, you've formed Village Capital to address it, and it's very entrepreneurial, very free market, but does the government have a role to play in helping to address some of these issues of blind spots? Ross Baird: Oh for sure, and over the last year I've been working on a fellowship with the Kauffman Foundation, which is the largest backer of entrepreneurial initiatives in the world and we've been looking at entrepreneurs accessing capital, and I think a lot of people, when they think about the role of government, with businesses, it jumps straight towards funding businesses. "Oh the government should set up a venture capital fund." One of the things that we realized in looking at all the issues and things the government has done, is direct funding of businesses, when the government has done that, almost never moves the needle. Government tends to not be very good at picking specific winners and losers in businesses. Ross Baird: What the government can do, is set up infrastructure and an enabling environment for businesses. So for example, if you say, "Every business ought to have the right to complete," what are the things that go into that? One is infrastructure. If there are all these ideas and thoughts that, "Hey wouldn't it be great if Charleston, West Virginia could be a place where people outsource computer work?" That would be great, there are huge broadband problems in West Virginia today and there are people who could be great entrepreneurs but because of the speed of internet in West Virginia, aren't able to do so, and there are certain policies and regulations that give different people different preferences on the internet, so that's one thing. Ross Baird: I think another thing is just broadly thinking about economic development. Economic development today is very top-down, and in the book I do an analysis of all of the funding that has gone into stadiums. Whenever a city builds a big sports stadium, say this is great, it's going to create all those jobs. Stadiums very rarely justify taxpayer expense, they're big. Things like Amazon HQ2, which there's a national competition who's going to get Amazon's headquarters, the incentives for a headquarters like that very rarely add up to being a good deal for the taxpayer, but there actually is very good return on investment and things that back entrepreneurs, things that back small businesses. It's done much less frequently because you don't get to do a big ribbon cutting when you've enabled ten thousand companies to create five jobs each, you can't do a big press release, but you get one company to do fifty thousand jobs, you can do a big press release and you can get a lot more credit. Ross Baird: I'd like to see economic development in government shift from a top-down, stadiums and big corporate headquarters, which are almost always bad deals, to bottom-up building infrastructure so that entrepreneurs can compete, and we are seeing some places that do that very well already. Glenn Yeffeth: Now, tell me why you decided to write this book. Ross Baird: I have a quote in the book from historian Shelby Foote where he says, "People shouldn't write a book because they think they've got something to say, people should write a book because they want to find out an answer and they want to share the journey." I just noticed so many things, dominance of big cities relative to small and medium sized ones, concentration of power in financial services, firms, increasingly the big is beating the small and there was a very coherent story to me, but I didn't see it told and I wanted to get what the story was doing and I wanted to share the journey with other people. Ross Baird: So I wanted to put into language what is going on in our country in this moment in time and try and diagnose what the actual problem is and try and propose some solutions and I think the actual problem goes back to the title, "The Innovation Blind Spot." People are in positions of power and authority are missing a lot and it's not because I think people are doing intentionally bad things, it's because people just don't know, and I think by introducing different voices, different places, different experiences into the conversations we can eliminate a lot of these blind spots. Glenn Yeffeth: Now you've, I'm sure, got a million things that you've got to get done each day. Somehow you've managed to get this book written, what process did you use to produce the book? And I'll just say for the record, it came in very strong [crosstalk 00:33:09]. No, thank you, tell me about your process. Ross Baird: I love writing and I've written a lot blog posts and different observations. I met early with a guy who's a writer for the New Yorker, whose work I really admire, and he said, "There is a difference between a newspaper article, a magazine article, and a book." And when I started, the thing I said, "There are all these great entrepreneurs like Jerry [inaudible 00:33:38], and you're not paying attention to them." He's like, "That's a newspaper article, we kind of get the point," and the worst books are the first paragraph you could basically not read the rest of the book and figure it out. So the problem is the innovation blind spot, what are the blind spots? Like, and spend some time on each of them and develop a narrative around each of them. Ross Baird: So I spend a lot of the time on how people make decisions, how power structures work, and looking at implicit bias in decision making, looking at why venture capital is structured the way it is. I did some research on the history of venture capital for the book and figured out that it was actually the structure we use today is related to 19th century whaling, it was really the first time that people built funds to invest in other people's stuff. And the original idea of whaling is most whaling expeditions are unsuccessful but if you are massively successful, let's build this very high risk, high return structure, and that still dominates the discourse today, I think in sometimes unhelpful ways. Ross Baird: The reason why famous universities and policy makers and corporate boards don't care as much about places like Roanoke, Virginia as they do New York City is they don't live in Roanoke, they don't know people from Roanoke, the people making decisions, so they're all related but I think the process of writing the book was trying to figure out is this problem we have a big problem or a small problem? It is a big enough problem to tell a story about? And is there enough substance to actually propose what might work. Glenn Yeffeth: Now, your book came out a year ago and this month ringing out the paperback, have you had any reactions to the release of the hardcover? Ross Baird: Oh sure, I started writing the book before Donald Trump got elected and I think that the timing of the Trump campaign and afterwards, all of the New York Times and Washington Post reporters all of a sudden are spending lots of time in diners in rural Pennsylvania trying to talk to real people about their feelings. There is a lot of media that came out after the Trump election that was speaking to some of the questions that are raised in the book and then there's been a lot in the technology and the entrepreneurship world around gender bias and racial bias and some of the things that we've been speaking about are really timely so I think people have felt that the book has been relevant and timely and has spoken to a lot of issues that have been very much in the mainstream since the book came out. Ross Baird: I think I did probably 20 different events, one of the thing that I noticed was the events in San Francisco and New York were good and people liked it, but actually the best attended events that I did were in places like Bend, Oregon or Roanoke, Virginia, Kansas City, Missouri, places where there are really spectacular things going on, I think that are not quite on the radar of the press or the media, and so I saw the message of the book resonate most with people who felt like they were in a blind spot. Glenn Yeffeth: That makes total sense. Alright, so for folks who want to learn more about you, learn more about your business, are you on social media? Is there any place to point them? Ross Baird: I am, I am @RossBaird R-O-S-S-B-A-I-R-D on social media, you can see the link to the book on there, if you've already bought it, thank you, you can also buy the paperback for a friend. If you haven't bought it, I hope you consider reading it, we can go into a lot more detail. Village Capital, the firm that I started and is been [inaudible 00:38:17] for a lot of the stories and experiences in the book, we are at VilCap.com. Thank you so much. Glenn Yeffeth: Thank you, Ross, pleasure. Glenn Yeffeth: Thank you for listening to the Building Books Podcast. If you enjoyed it, please leave a review on iTunes, where we'll be happy to listen to it, or share it on social media. If you're an author who wants to submit a proposal or pitch to BenBella Books, please go to BenBellaBooks.com, click on the "for prospective authors" button, and it'll lead you through a little form make it real easy to submit to us. Thank you.